If you’re looking for something fun to do with your family photos, and you’ve also been thinking about sprucing up your home, a really great way to make those pictures count is by turning one wall into your very own family portrait gallery. Head over to frames.co.uk, pick up a bunch of frames, fire up the printer and choose the best pictures of each family member, Print them out, put them in the frames and then hang them up, trying to take up as much of the wall as possible. It’ll look amazing! If you’re the kind of family that likes to sit around the table playing board games and doing puzzles whenever you get some precious downtime, why not use your family photos to create your very own jigsaw. A family portrait makes the perfect subject matter and the kids will have so much fun piecing the family together that it will be well worthwhile. Whether you use an app, like the one at iphonephotographyschool.com to turn your photos into pop art, you use them as a visual aid to create your own paintings or you print them out and turn them into collages or photo books, using your family photos as the basis of your arts and crafts is a great way to have fun as a family. It’s also a good way to encourage creativity, and you just might get some fantastic art for your home out of the bargain too, depending on how talented you all are. There are some fabulous apps that will allow you to digital turn your best family pictures, taken on your phone, into postcards. All you have to do is input a message and the recipient’s address and the app company will take care of the rest. 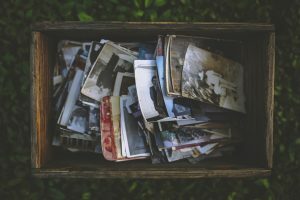 This is a great alternative to sharing your favourite family photos on social media if, for instance, some of your friends and family don’t use Facebook, or when you want to surprise grandma with some pretty pics of the kids. Have some sent back to the kids too; they’ll love getting something in the mail! Next time one of your family members has a birthday or special occasion coming up, why not treat them to a cake, and not just any cake – a cake with their face on! It’s funny, sweet and ensures that your family photos are used and appreciated. If you don’t think they’d like having their own face on a cake, maybe they’d like a pick of the kids, grandkids or even the family dog instead! It sure beats having a cake with generic frosting, don’t you think? If you’re looking for a fun Christmas craft to try with the kids, why not create a digital collage of photos that you can print out and use as wrapping paper. It’s pretty simple to do if you have a computer, but there are companies who can do it for you if you would prefer too. It looks amazing and having your picture on all of your presents instead of a name tag is so much fun for the kids, and honestly, the adults will probably love it too. If you’re looking for something a bit more simple, why not invest in a digital photo frame, which you can load all of the families favourite pictures onto? The frame acts kind of like a screensaver, cycling through your photos so that they all get a chance to be seen,. It’s a good way to keep the memories alive and a clutter-free way to display them in your home. What’s not to love? Have fun with your family photos! Common Matched Betting Problems – Solved!